While I was in Venice I started a blog experiment and over this holiday break I applied to join some affiliate campaigns. It was like going back to 2002 again! Did you know I used to run the TradeDoubler UK Yahoo group where I'd announce new campaigns and chat with other early affiliates?. I wish I'd kept that group live just to review the archives. Anyway! It has been really interesting reviewing how the networks, agencies and the merchants themselves go about approving requests from affiliates to join the various programs. In particular I've been using various web analytic solutions (which are nothing like 2002 web stats!) to monitor how each behaves online. As an affiliate you're better off having your site reviewed by an agency. My test blog has been reviewed by three agencies who, on average, spent 78 seconds on the site. Yep, on average when a merchant themselves was on the test blog they spent 5 seconds reviewing the site. Stats from Get Clicky make this very easy to see. 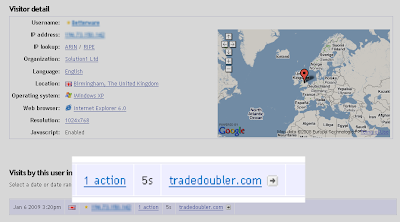 In this case we can see the merchant came in via their TradeDoubler interface. I've let you see they're in Birmingham but hidden the IP address. Shortly after this visit a Birmingham based TradeDoubler merchant decided the test blog wasn't right for their campaign. You can see that they spent exactly 5 seconds in this case. The quickest decision seems to have been made after a 2 second visit. To be fair this is a test blog in a very niche area, with a professional theme with the ads dialled all the way down. It is entirely possible experienced decision makers can decide whether the niche matches their brand/campaign with just a look. Nevertheless, the differences between agency time on the site and merchant time on the site is staggering. It's is also worth noting that so far agencies and networks seem to look at different pages on the site. Networks look at the content pages - the blog posts. Agencies tend to look at the About page and then hit the category tags.